Prepare for some changes to the Gwent we know and love. The Witcher 3: Wild Hunt spawned a generation of digital card addicts with its inbuilt card game, Gwent. The product of several inventive minds at CD Projekt RED, Gwent gained massive popularity among players and is considered by many to be one of the best features of the Witcher 3. An outpouring of encouragement from fans prompted the Witcher 3 developers to finally make a standalone Gwent card game, which is currently still in development and will host a beta test in the coming months. On the surface, Gwent can appear rather simple. The game simulates a battlefield, using three rows to represent each player’s offensive and defensive lines. The complexity comes from knowing the strategy behind each card and understanding how your faction stacks up against all others. Factions determine the play style of each player, and every player has a preferred faction they like to use. This ain’t your grandma’s Gwent game, however. Early gameplay of Gwent: The Witcher Card Game at E3 illustrated several major differences between the standalone and the version we’re familiar with in the Witcher 3. 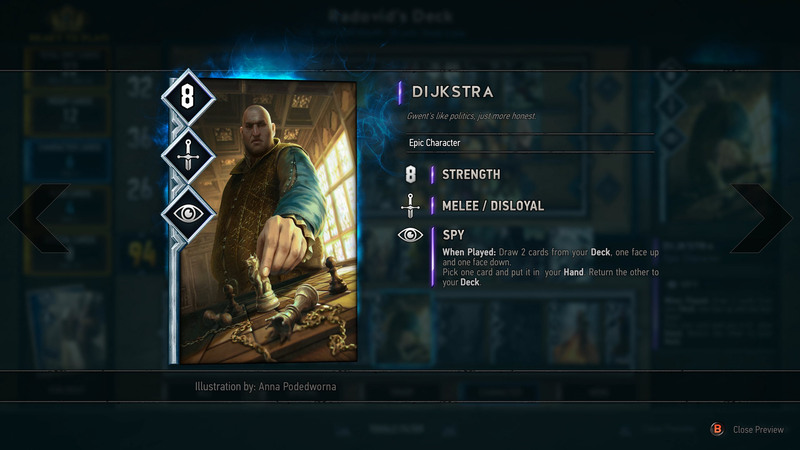 For those of you who haven’t been keeping up with Gwent’s latest makeover, here's an overview of some notable changes to Gwent that players should be aware of prior to the upcoming beta. The developers of the new Gwent standalone have decided to shake things up a bit by changing the card values for a majority of cards in the game. This means that seasoned Gwent players will need to adopt entirely new strategies for the upcoming standalone. Some changes are subtle, like simple power increases to Hero cards. However, there are already a few alterations so far that may initially surprise some unknowing players. One example is the change to the Spy card abilities. In the Witcher 3 version of Gwent, Spies are particularly important for both the Northern Realms and Nilfgaard factions. A player who uses a Spy card must place the card on their opponent’s battlefield in exchange for drawing two new cards from their own deck. In the new Gwent game, Spies still allow players to draw two cards, but they can only choose to keep one, instead of receiving both automatically. One of the two drawn cards is also flipped upside down, making each Spy card a gamble. A player who wields a deck full of Spies can quickly replenish the cards in their hand, usually with more powerful Hero cards. Given that you initially begin with only 10 cards in your hand, having the simple ability to continuously draw more and better cards usually put Spy-heavy factions at a huge advantage. The adjustment to Spies was most likely an attempt to balance the powers of these factions in a way that forces players to deliberate more carefully about their next move. Much like the changes to the card values, it appears that some Faction Perks will be adjusted as well. 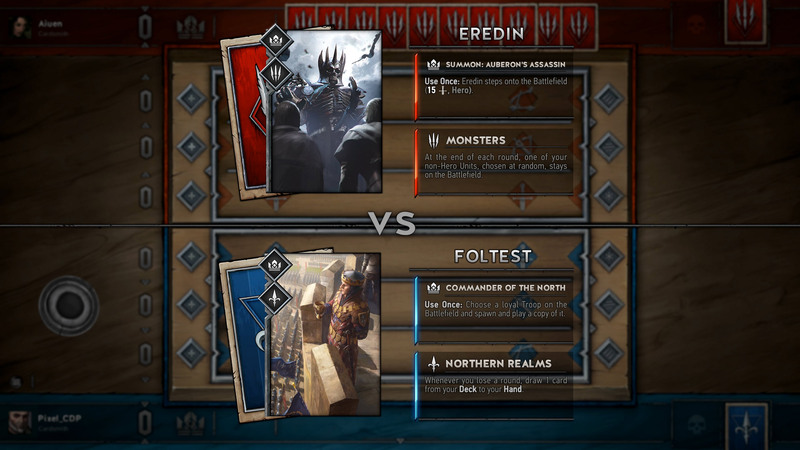 Based on gameplay screenshots from E3, the Northern Realms Faction Perk now states that when a player loses a round, he or she can draw one card from the deck and place it in their hand. The only difference here is that in the previous game, Northern Realms players would draw a card upon winning, not losing. During E3, the developers talked about how they wanted to emphasize the strategy of intentional losses. 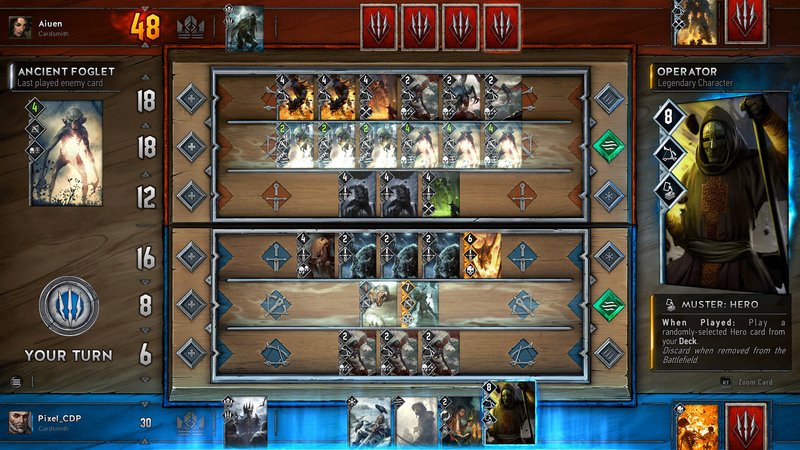 Since Gwent is a best-of-three setup, players can purposefully lose in the first round in order to have more cards in-hand going into the next two rounds. This strategy works more often than not (at least against daft NPC’s), and this seems to be the motivation behind the change to the Northern Realms faction perk as well. The new Gwent standalone will be the first time players can face off against real opponents in multiplayer matches. While most of us expected a standalone Gwent to feature multiplayer, what we didn’t anticipate was the inclusion of a complete single-player story campaign. 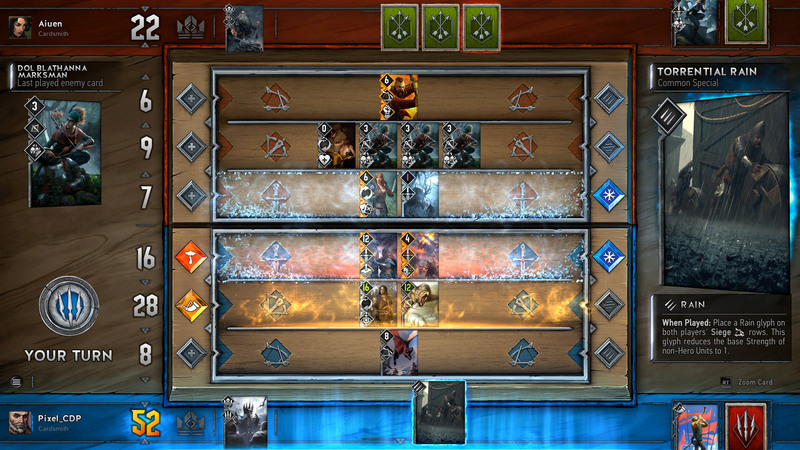 Players assume the role of a particular character, who must “Gwent” their way through various parts of the Witcher world while meeting familiar characters along the way. The game features crisp visual animations to liven up each Gwent battle, and to top it off, the entire campaign is fully voice acted with the original voices from the Witcher 3, including Geralt and many others. Despite some of these key differences, the new Gwent will still be recognizable as the same addictive mini-game that kept us occupied for hours. Gwent: The Witcher Card Game is shaping up to be exactly what players asked for, and it will undoubtedly exceed all expectations.